I remember a couple of months ago I was going on about the bacteria that live in our guts. Some bacteria really thrive on stuff we eat, and usually, it’s things that we can’t digest. They can turn those foods into stuff we can use. For instance some of the starches in beans we can’t digest. Turns out, bacteria can, and when they do they give off a gas known as methane, but to kids its known as farts. Back then I was mentioning that when something claims on its LABEL that it is ‘low-fat’ that sometimes that means that the fats it does contain are actually just fats that you cannot digest. The bacteria in your gut sometimes can, though, and sometimes the results are comical, like diarrhea. 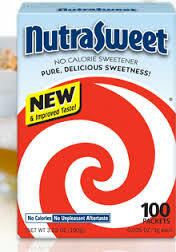 Another common thing that modern food makers like to do is put a ‘sweetener’ in a food that contains ‘zero’ calories, meaning that the resulting product tastes sweet, but that the chemical that it is made of cannot be broken down immediately by your guts into something that acts like real sugar does. I remember saying at the time that ‘it does, however, break down.’ I love it when later on I get to read in the paper that science is right behind me with proof of the point that I was making. If you drink these man-made chemicals that are not sugar, you can rest assured that scientists are already arguing that your results may vary. Perhaps the mice were genetically predisposed to glucose intolerance. Oh. I guess maybe it is because something in the chemicals we put in our bodies, even though they are not sugar, are still chemicals. The do do something. Now we know what they do. Now we know why people who drink tons of drinks with ‘zero calories’ can be the fattest people that we know. The problem is that we eat ‘low fat’ foods, we eat ‘low calorie’ foods and we believe the marketing on the labels that these things are better for us than alternatives that have fat and calories. It just turns out that it’s too good to be true. It turns out that it’s actually a lot more complicated than that. It turns out that any food with a health claim on the label should be avoided. The chemicals in it have never been through anything like a drug trial. Probably we should avoid all manufactured food. Maybe we should just eat single ingredient foods that have existed for the last hundred years. Maybe we shouldn’t eat any foods out of boxes, bags or bottles. This entry was posted in Health, Poetry and tagged artificial ingredients, glucose intolerance, microbiome, sweeteners. Bookmark the permalink.